Def Leppard has sold over 100 million albums worldwide, two albums that have sold over 10 million each, and 10 consecutive songs that made the Billboard Top 40. But they’ve never made their music available for downloading or streaming – until now! 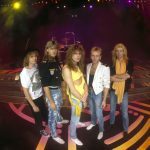 Def Leppard Streaming and On Tour: All Access celebrates one of the world’s most popular band’s 39-year career with some of their most beloved songs. It features interviews with Joe Elliott, Phil Collen, Rick Allen, Rick Savage and Vivian Campbell. They carry us through their history, why it took so long for their catalog to go digital, and talk about their upcoming blockbuster tour this summer.